An intense rain and thunderstorm has just passed over Wyoming's Grand Teton National Park. The summer storm has cleared just in time to allow for the last rays of the day to glow on the Grand Teton range. The leftover clouds from the intense storm glow as the sun sets and Jackson Lake reflects the intense colors of the sky. 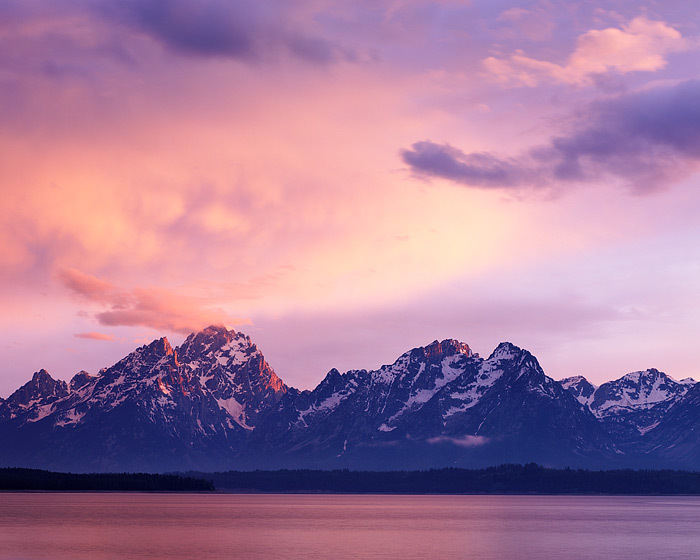 Soon after I was done exposing this view of the Tetons and Jackson Lake, the sun set and the lightshow faded. This classic Wyoming location is tpically photographed in the morning hours, but with this otherwordly sky, it turned out to be one of my favorite images of Grand Teton National Park. Photo © copyright by Thomas Mangan.